Home/Archive by Category "Federal Budget"
If you’re the kind of person who loathes surprises, preferring to be fully apprised of impending gifts before birthdays, anniversaries or Christmases, then chances are you would have loved the recent Federal Budget. In fact, if this Budget was a surprise birthday party, the guest of honour would have known weeks in advance. No hushed party guests waiting excitedly in the dark before trumpeting a raucous “Happy Birthday” to the unsuspecting party girl, or guy. No, Treasurer Scott Morrison well and truly ensured Budget Night was a ho-hum affair, by historical standards, by virtue of the fact he’d been spruiking its apparent highlights for at least two weeks. It’s not unusual, of course, for governments to drip-feed us some of the more favourable aspects of a budget before it’s officially handed down, but what we saw this month was a backs-against-the-wall government keen to gain maximum political bang for their budget buck ahead of next year’s election. So far, it seems to be having the desired effect. The Coalition will be pleased with its budget bounce, the latest Newspoll out yesterday (Monday) has Prime Minister Malcolm Turnbull extending his preferred PM lead over Opposition Leader Bill Shorten to 14 points (from 3), although Labor continues to hold a 51-49% two-party lead. Post-budget opinion will soon be tested on the ground in five byelections, four of them caused by the citizenship fiasco, which ironically ensured this year’s Federal Budget enjoyed its shortest ever news cycle. So, what to make of the actual budget measures? 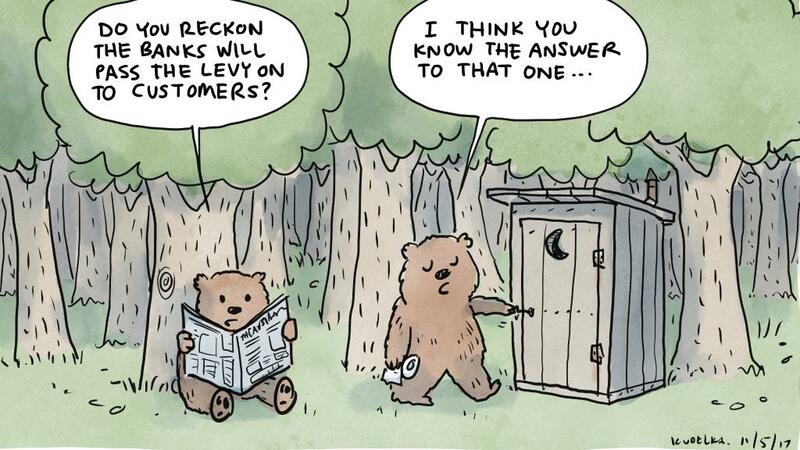 From a financial services perspective, there’s not a lot in it. The Majority of you will have read the facts and figures by now, and will have an understanding of the changes. This summary is not a simple reiteration of these facts. As is customary at FinSec we wait to analyse the many budget reports hitting our inboxes and try to seek clarification on the ambiguous before providing our own analysis from a financial planning and wealth perspective. If imitation is the sincerest form of flattery, Wayne Swan should still be feeling quietly chuffed. Since Treasurer Scott Morrison handed down his almost Machiavellian political manifesto masquerading as a federal budget last week, much has been made of its giant leap to the left. Hit the banks with a $6.2bn levy (“nobody likes them anyway”), give more money to schools, introduce a 0.5 percent increase in the Medicare levy to help fund the National Disability Insurance Scheme and throw in a sweetener to help struggling first home buyers one day (possibly, maybe) move out of Mum and Dad’s or the rent cycle. In fact, Morrison and PM Malcolm Turnbull are now singing so loudly from the opposition’s hymn sheet, they’ve expertly rewritten the national narrative and, with it, quite possibly disaffected Middle Australia and the millions of votes it represents. In unpacking Morrison’s much-anticipated second budget, it’s become clear just how much of a political masterstroke it is. There were some main motives behind the measures. Amid competing pressures of an overheated property market, slow wages and economic growth, cooling commodity prices on the back of a levelling of China’s rapid growth, and ageing big-city infrastructure not to mention persistent, troubling polls for the Coalition and Turnbull the stakes were high. This is a budget which needed to prove the government was listening; and it does, whilst casting the Coalition as “nation builders” through “good debt”. They’ve largely left alone some of the high-impact contentious issues of the past (changes to superannuation and Centrelink for example) which caused them so much heartburn, and softened their dogged return-to-surplus mantra in favour of a more pragmatic approach to budget repair. Whether or not you believe reports the bank levy was concocted on the run, tacked on to plug a budget black hole, the reality is it works on several fronts. It works because it’s politically savvy. You’re never going to lose from attacking corporations the public dislikes anyway. (The levy will be imposed on the big four commercial banks, as well as investment bank Macquarie Group). It works because it delivers a quasi-interest rate rise outside the RBA cycle, thus potentially taking some much-needed heat out of the property market. There’s little doubt the five banks will pass on the tax to consumers via a rate rise which would take the standard variable rate from 5.25% to 5.45% equivalent of 20 basis points to offset the levy, potentially creating more competition in the market. And even if they don’t and the new tax is funded by shareholders via a reduced dividend, the levy may go some way to tempering an advancing stock market (the Big 5 constitute more than 25 percent of the All Ordinaries index), with absolutely no political fall-out. Genius. It also works because it raises significant tax revenue and effectively counters opposition calls for a Royal Commission, which risks casting Australia’s banking system as unstable and threatens to slow the flow of funds from foreign lenders, thus increasing the price of money. Publicly, the government was also under mounting electoral pressure to act on the big-ticket issue of housing un-affordability (particularly on the Eastern Seaboard) and help give struggling first home buyers a leg-up into the market. Privately, though, they’re loathe to create too much of an incentive for fear it’ll further flood the market with buyers. So, they’ve tinkered around the edges. The first home super saver scheme, in which prospective first home buyers will be allowed to salary sacrifice up to $30,000 or a maximum of $15,000 a year into their super accounts for a deposit, is more of a crumb, than a carrot. They’ll grab the headline, and credit for doing something, but $30,000 won’t go far, especially in Melbourne and Sydney. Former PM and treasurer Paul Keating has grabbed his own headlines, this week, labelling the scheme “appalling”, insisting it will only add to property prices and runs against legislation the Coalition currently has before the parliament to enshrine the purpose of super. It’s also worth noting the tax impact of the incentive, in the bigger scheme of things, is negligible. For the average income earner, it may save about $3000 in tax over the saving period. Not to be sneezed at but unlikely to make material difference to the conundrum of affordability. If successful, the incentive not only releases housing stock, it cleverly improves people’s capacity to spend, providing a nice little kick to the economy while reducing the government’s commitment to the Age Pension by transitioning funds from an exempt asset to an assessed asset. Morrison and Turnbull are the architects of a budget which has unapologetically, and unashamedly borrowed the best of the left. It’s strategically brilliant but it’s success will, ultimately, depend on the results of other “games”. The Chinese economy must continue growing at projected levels ensuring commodity prices remain solid or the deficit will continue to blow out. The US economy needs to continue on its current path to growth with modest inflation. Our housing market needs to plateau and hold (not collapse) allowing incomes to catch up and the world needs to remain predictable for the foreseeable future as markets are still easily spooked by surprises. Not to mention the small issue of the budget requiring passage through both houses of Parliament to be implemented! Wayne Swan may be flattered, but Bill Shorten must be fuming. The Budget has dominated the headlines this past week. In short, despite the wailings of the media, it’s a ‘Storm in a Teacup’ budget. Bit of extra spending here, a few more tax increases there, the continued promise of an imminent return to surplus and political opportunism at its core. Many of you will have read the facts and figures by now, and have an understanding of the changes. This summary is not a simple reiteration of these facts. As is customary, we try to go one step further and explain what we see as the key changes relevant to our clients. Essentially, this summary represents our view. We trust that you enjoy reading, and we look forward to speaking with you individually about how this budget may impact your personal circumstances. Morrison’s $500,000 backflip – “mostly” good news for superannuation. Note: This article was updated 21 September 2016 to include further clarity with regard to transitional rules. The Federal Government has made significant changes to its superannuation package, including dumping plans for their controversial $500,000 lifetime cap proposal. Although the revisions (and the package as a whole) are yet to be legislated, the announcements certainly bring it a step closer to reality. Below we have summarised the changes and what they mean for you. Proposal for a lifetime cap of $500,000 on non-concessional contributions, backdated to 2007 has been scrapped. The mechanism for making concessional and non-concessional contributions will revert to current rules. However, come 1 July 2017 the amount of non-concessional contributions you can make (per financial year) will be reduced from $180,000 to $100,000. Individuals aged under 65 can continue to bring forward 3 years worth of non-concessional contributions ($300,000 down from $540,000 from July 1, 2017). *** September 21, 2016 the Government provided further clarity on how the proposed bring forward and the $1.6 million eligibility threshold will work, please refer end of article. This revised plan leaves pre-budget rules in place until June 30, 2017. Note: At this stage the proposed $1.6 million Superannuation transfer balance cap has not been removed (for more information on this proposal please refer to our Budget report – click here). This announcement is a welcome reprieve for many Australians, particularly those approaching retirement – their plans (based on the strategy of the day) now remain somewhat intact. i) The scrapping of the proposal to remove restrictions around minimum work requirements on people aged between 65 and 74 wishing to make voluntary contributions. As per current legislation, individuals aged 65- 75 years will once again have to satisfy a work test (and cannot use the ”bring forward rule”) – an unfair complexity we think! This group stands to lose the most from this backflip. For example; where couples might want to equalise their balances to avoid the $1.6m cap. ii) Delaying by 12 months (from July 1, 2017 to July 1, 2018) plans to allow people with interrupted work patterns to roll over unused concessional contributions from the previous year. It has always been our belief that the average worker would find it hard to take advantage of this rule anyway. We understand it’s purpose and we like the spirit, but we do question the reality. For example: how many mothers returning to work (often part-time) have excess income after mortgage payments, car payments, school fees and so on… with which to make additional super payments? To this end we believe delaying this measure by 12 months will have minimal impact. We are pleased (but not surprised) that the $500,000 lifetime cap on non-concessional contributions has been ‘retrospectively argued away’. Morrison’s compromise, approved by the party room yesterday has gained the government valuable momentum in helping to create the view that progress of legislation, is in fact possible in the senate. $6.3 billion over four years may not be a large amount in the context of a budget spend of around $400 billion a year but to Jenifer Hewett’s point (Australian Financial Review, 14th Sept 2016) “with both sides engaged in a conspiracy of silence over the real size of the budget task, it’s convenient for both to sell the notion of a substantive breakthrough as well as the sort of bipartisan compromise that is popular with voters”. The Government has provided further clarity on how the proposed bring forward and the $1.6 million eligibility threshold will work. Where an individual has triggered the bring forward in 2015/16 or 2016/17 but has not used it fully by 30 June 2017, transitional rules will apply. Where an individual triggers the bring forward in 2016/17, the transitional cap is $380,000 (the current annual cap of $180,000 plus $100,000 annual cap in 2017/18 and 2018/19). See examples 1 and 2 in the table below. If an individual triggers the bring forward in 2015/16, the transitional cap is $460,000 (the current annual cap of $180,000 in 2015/16 and 2016/17 plus $100,000 annual cap in 2017/18). See example 3 in the table below. Note: these measures are not yet legislated. Draft legislation is expected in the next few weeks. Scott Morrison’s maiden budget speech was the first since Peter Costello’s debut 20 years ago that did not include the word ‘surplus’ an unreported, but perhaps telling, fact. It is no secret that the 2016 Federal Budget made negligible progress on improving Australia’s bottom line. Projecting a small surplus way out in 2020/21 it has experts concerned about the future of Australia’s AAA credit rating. But, to its credit, this pre-election budget didn’t make things worse. Debt accumulation seems to be held and (retrospective super tinkering aside) policies are, for the most part, “harmless”. So let’s talk motive for this seemingly benign budget. ‘Quintessentially political’ and a ‘bow to the altar of fairness’ is, of course, the popular view. Morrison claims it is all about the economic plan and, more specifically, Australia’s transition from the mining investment boom to a more diversified economy. This is a formula he hopes will restore credibility in terms of both the Coalition’s promises and their traditional strength of economic management. True motive unknown, one thing is certain: the government wants this budget to appear calm on top while working hard underneath. The judgment here is less about ‘who’ the government has gone after and more about its modest proposals. And with the word ‘surplus’ conspicuous by its absence, perhaps debt is one of the driving forces behind this modesty. The world is staggering under a record amount of debt. Household, corporate and government debt are at unmatched levels in absolute and relative (to GDP) terms. According to a McKinsey Global Institute report on debt levels across 47 countries, it is estimated that global debt soared from US$142 trillion (A$187 trillion) in 2007 to US$199 trillion in 2014. Over these seven years, the ratio of debt to global output climbed from 269% of world GDP to 286%. The report found that, over the past seven years, no major economies and only five emerging countries, (Argentina, Egypt, Israel, Romania and Saudi Arabia) have reduced relative debt. Concurrently, 14 countries boosted total debt by more than 50 percentage points. During this period, Australia’s total debt climbed 33 percentage points to 213% of GDP. The report also found that household debt has climbed to concerning levels in Australia (no surprise), Canada, Denmark, Malaysia, the Netherlands, South Korea, Sweden and Thailand. China has a special case of debt addiction all of its own. From 2007, Beijing instructed state banks to commence a lending frenzy that resulted in total debt jumping 82 percentage points to 217% of output (and more recent studies put it at 240% of GDP).It is no surprise that all this debt poses an unprecedented threat to the world economy and long-term financial stability. The probability that vast sums of the money will never be repaid (and will need to be written off) is high. Such an outcome could trigger systemic banking failures and, as the saga of Greece shows, without a global mechanism for dealing with sovereign default, any government bankruptcies will be messy. But there is a flip side to debt. Borrowing is not a bad thing in itself and, in fact, debt is often referred to as the lifeblood of capitalism: the driving force that has lifted living standards for decades. At a micro level, debt enables people, companies and governments to manage cash flows over time. Sovereign debt, in most cases, provides investors with haven investments. Governments can safely borrow unceasingly if their fiscal deficits, as a percentage of GDP, are below the rate of economic growth. The problem is, there is no definitive point where debt can be categorised as ‘too high’ and hence ‘too risky’. It’s a balancing act and, at some point, the accumulation and risk have to be managed. Is there a solution?Current policy makers are tasked with the desperate need to devise new solutions to dilute the threat from too much debt. This is particularly so since much of the collateral people and companies have borrowed against are assets priced at apparently unsustainably high values. The difficult task for policy makers now is to curtail debt the “right way”. The worst action they could take would be to taint debt as “bad” and encourage excessive repayments. This would serve only to threaten the consumption and investment needed for a functioning economy. Take, for instance, the experience of the Eurozone: austerity measures shrunk economies faster than they reduced debt, entrenching deflation and boosting the real value of debt. The fact is most Governments, households and businesses can manage their debt loads, provided economies continue to hum. Which brings us back to Morrison and his Budget. Whether it was intentional or not, there is an underlying pragmatism that should be acknowledged. The proposed measures are certainly in sync with a strategy that aims to keep an economy ‘humming’. Debt accumulation is stabilised, with no demands for a return to surplus (over the short-medium term) and is therefore, void of those pressures. Morrison does not want a nation of panicked people. Ask ordinary voters if they are better or worse off as a result of this budget, and the answer is likely to be “no change”. Gone are the messy policy thought bubbles such as a higher GST, cracking down on negative gearing excesses, or major income tax changes. Most of those “bubbles” have been comprehensively pricked. This is a budget that, on the surface, the government wants perceived as tough on its own base, not ordinary taxpayers. But at a deeper level, is possibly more economically calculating and strategic than many give it credit for. Will it be enough to ensure the re-election of the Coalition for a second term? We will have to wait and see. Of course the opposition and some segments of the media have it destined to an unhappy fate, but despite their best efforts this budget seems to have achieved the rare feat of keeping the harmful blows at bay. Perhaps in doing less, Morrison may actually have achieved more. Nothing has highlighted the unintended consequences of tinkering with retirement income more than last month’s federal budget. The fiscally and politically potent combination of age pensions and superannuation is always complex, however this budget has left many financial analysts scratching their heads. The proposed changes to the Age Pension eligibility criteria, put forward by Minister for Social Services Scott Morrison, will have major ramifications for retirees who had carefully planned for their financial future. While the tighter rules are designed to stop wealthy retirees living off the government, it’s likely they could have the perverse effect of encouraging pensioners to blow their savings just so they can continue to receive benefits. The formula just doesn’t add up. Meet John and Jan, who are retired. They own their family home and have $375,000 in superannuation assets. Under the proposed new legislation, they are eligible for the full age pension. Like most retirees they will invest in “safe” investments and expect to make a modest return of around 3% on their super. This return, combined with their pension entitlements should deliver an annual income of nearly $45,000, whilst maintaining their capital. In theory they could choose to supplement this income by drawing down on their super. Retired couple number 2, William and Sally who also own their family home have worked hard at saving for retirement and have a superannuation balance of just over $800,000. A figure they were told would deliver them the ‘comfortable retirement’ they desired (as defined by the Association of Superannuation Funds of Australia and published on the MoneySmart website). They have spent the last decade actively planning their ‘golden years’ and factored in an annual income of around $60,000. Like many others William and Sally have been assuming the age pension would complement their income from the outset (roughly $15,000 out of the $60,000) and gradually increase over time to make up a much larger proportion in their latter years. The balance would consist of around $25,000 in super earnings (based on the same 3% earning rate as John and Jan) and an annual drawdown of $20,000 on their super balance. But on budget night, the government turned William and Sally’s plans on their head. Under the proposed new rules, William and Sally are no longer eligible for any government pension at all. In the proposed new environment the “comfortable” retirement they were promised will now cost a further $15,000, increasing their super drawings to $35,000 per year. Put in perspective John and Jan (receiving a full pension) could choose to live on a similar income by drawing only $15,000 from their super per year. It’s estimated that William and Sally would be among 300,000 full or part pensioners set to receive less if the government changes are legislated. According to analysis by Rice Warner, half of all people leaving the workforce within the next decade will be affected. For these middle retirees, the obvious alternative is to spend more assets more quickly in order to qualify for the part or full pension … for a nation facing a ‘budget crisis’ this seems contradictory. The direction of the overall policy indicates a greater expectation that Australians will plan and provide for more of their own retirement in the future. But unfortunately Mr Morrison’s formula will squeeze middle retirees the most. There has already been a substantial amount of commentary around the inequality of these changes, a sentiment it would seem Bill Shorten and the Labor party share. On Tuesday Labor attempted to block the proposal only to have the move foiled by the Greens who announced their support, conditional on the Government considering changes to superannuation in its Tax White Paper. Let’s hope that good sense prevails with an outcome that considers the reality of the numbers, the retrospective impact of the proposal and acknowledges that, for most retirees, income from super and from the pension is totally intertwined. At it’s core the strategy of the government is not without merit but to introduce the changes retrospectively undermines the integrity of the plans laid out by current and soon to be retirees. If the changes were to be introduced for people retiring after 2025, plans could be amended accordingly. THE BUDGET WE HAD TO HAVE! We can’t help but think Cicero was on the money (no pun intended) when he proclaimed these words so long ago. Now 2,069 years later, our countries leaders are struggling to find the ‘straight talk’ to deliver in essence this same message. Instead and regardless of positive intent, poor strategy, poor communication and poor media management have combined to kill the story of the budget and its real purpose. It has now undeniably become totally consumed by the focus on broken promises, the denial of broken promises, the possibility of an early double-dissolution election, a civil war with state leaders over funding cuts, and a premature debate about whether the GST rate should rise or its base broaden. As Jennifer Hewett said in her column last Friday (Australian Financial review) “may the political circus begin”.If you really wanted to sell a budget, you should look at everything the Government has done over the past two weeks and do the opposite.There is no denying of course that these problems arose from the landmines Tony Abbott himself planted during the election campaign when he pretty much promised everything to everyone. Accordingly Australians (based on the polls) have decided the budget is unfair. Some may have a point and they’re right, too, to complain about Abbott’s broken promises. But it has to be said, was it ever really going to be possible to return the budget to surplus without raising taxes, or cutting spending on health and education, or reducing pension entitlements?Perhaps Jonathan Holmes was right when he said “The Australian electorate will punish the tellers of hard truths, and reward the snake-oil salesmen, the good-news spruikers, the soft-soapers”. (Sydney Morning Herald, 21st May 2014). Arguably the most objectionable part of all, is Bill Shorten’s refusal to recognise the scale of the budget repair task, in-fact he refuses to acknowledge there’s even a problem, to use his word it’s all a ‘myth’. A political circus indeed!Back to the budget purpose – bring Australia back to surplus and address the demographic necessity of change. Politics aside let’s look to the facts, the real economics behind the 2014/15 Budget and our verdict – The budget we had to have!People weren’t ever going to like this budget, it is tough and it will hurt everyone. There are many budget measures we’d advocate for change (is the age of entitlement really over for everyone…), however we are broadly supportive of it’s purpose and we do believe it’s the ‘budget we had to have – here’s why. We do agree that right now Australia does not really have a ‘budget emergency’: the budget deficit has not come anywhere near the 10% of GDP levels that sparked concern in the US, parts of Europe and Japan. That said, the budget is always about balance and Australia does have a budget problem. After the biggest boom in our history, there is an argument for stating that the budget should be in better shape. Against this backdrop, the 2014-15 Budget is a step in the right direction with the measures put in place to control spending growth over the medium to long term likely to put it on a sustainable path. Without some fiscal repair, Australia was exposing itself to huge risks, if and when the cycle turns negative. 2. Australia is facing a longevity crisis. The age pension has been set at 65 years since it was introduced over 100 years ago (1909). In 1910 the average life expectancy of a 65 year old (post retirement) was on average 12.1 years, in 2009 20.25 years – the government is now funding payments for an extra 8 plus years. The below chart compares retirement ages and life expectancies in 2009 with those from 1901. Figures are based on ABS Australian Historical Population Statistics 2008; ABS Deaths. Australia, 2009. Medical technology has prolonged both the quality and the quantity of life. However we aren’t working any longer to pay for this. 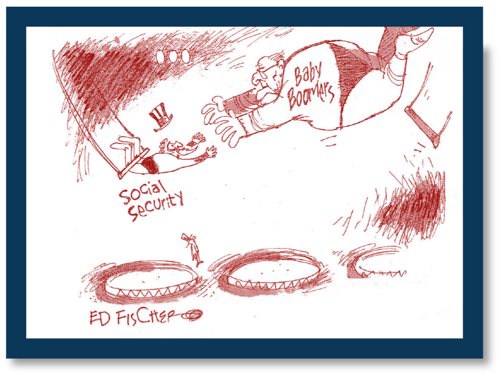 Putting even more pressure on the social security system is the ‘Boomer Impact’. In the next 20 years the number of people over 65 years in Australia is set to double. Based on conservative figures Australia would need to find a whopping extra $13 billion dollars per year to support it’s ‘boomer’ pensioners. Interestingly, around 80% of Australians who have reached Age Pension age currently receive a full or part Age Pension. Some couples who hold more than a $1 million in assets (in addition to the family home) are currently eligible for a part Age Pension. The other challenge that comes with the retirement of the baby boomers is the issue of productive workers leaving the workforce. Less workers to do the work will potentially impact on productivity and consequently economic growth. If there are less workers earning an income, there will be less tax revenue collected to fund the burgeoning pension bill. In effect this will place the economy in a pincer movement which unless managed very deftly by successive governments over the next 20 years will deliver genuine potential for the budget emergency that has been mooted. These statistics all come together to paint a dramatic picture of the demographic, market and regulatory landscape around retirement incomes and why things have to change. Just a “myth”, “no emergency” they say, we’ll let you be the judge of that! 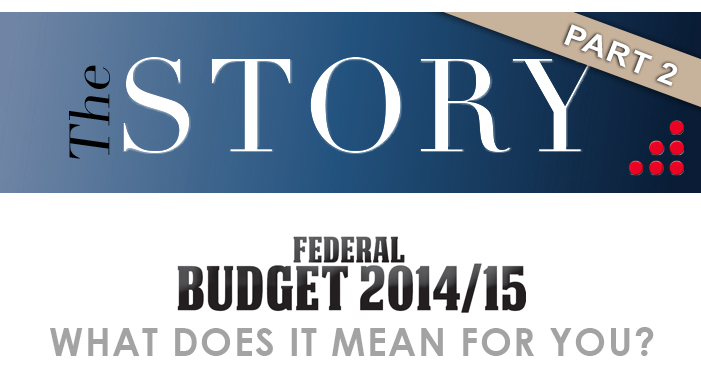 The Story Part 2: Federal Budget 2014/15 – what does it mean for you? On Wednesday we brought you ‘The Story’, a budget summary outlining the key proposals from Treasurer Joe Hockey’ s 2014-15 budget. Now the dust has begun to settle we bring you ‘The Story Part 2’ – What does it mean for you? 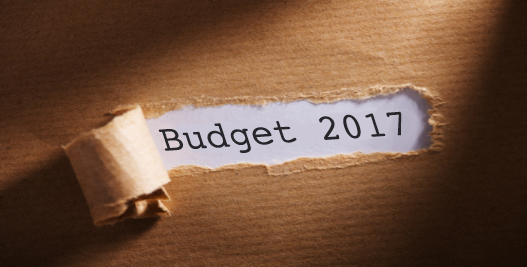 How could the Budget proposals change the way you live, work and pay for services on a practical day-to-day level? Here’s a round-up of what the 2014-15 Federal Budget could mean for your family finances. As always, if you have questions relating to your personal circumstances, we encourage you to contact us by email, or phone and we can discuss the changes in greater detail. But don’t forget, the proposals may change as the legislation passes through parliament.